File Types: PSD,JPG,All Files; File Size: 284.82 MB; Requirements: Adobe CS5+; Layered: Yes; DPI: 300 DPI; Dimensions: 8.5 x 11 in11 x 8.5 in. 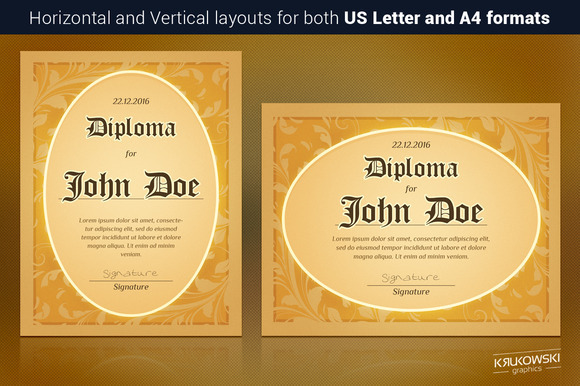 Retro Diploma is Print Ready Template. Universal certificate, diploma for your employees or students. Prepared in both horizontal and vertical layout in two sizes A4 and US Letter. You can use it in both personal and commercial projects. - 4 customizable PSD files with named and organised layers. - Easy to add your own text and change colors. - Only free fonts used (links included). - A4 horizontal size 29,7 x 21 cm (Bleeds 0,3 cm at each border) Photoshop is required to edit this template. Keywords: vintage, elegant, design, decorative, template, retro, ornate, ornament, decoration, diploma, border, calligraphic, calligraphy, antique, certificate, seal, shares, modern, typography, ribbon, stamp, luxury, print, frame, art, achievement, background, success, graduation, document.